Well, is your pronunciation of German good? Do you master word order? Incredible long German compound nouns don’t frighten you anymore? If your answer is yes, I am really impressed. But I have to remember you, that you are learning German. And that means more and more exceptions and rules – their is still a long way to glory! Nevertheless, you have reached a crucial topic of the German language: German cases! In order to glance in conversation or written messages, you necessarily have to master grammatical cases. So, as you have chosen language-easy.org, you don’t have to worry anymore. Together we will learn how to get German sentences together easily, talk again about prepositions and also about direct and indirect objects. So, without further explanations, let’s just start right ahead with German cases, their explanation and some examples! Unfortunately, we are going to start with the worst but also most important part of this article and directly explain the four cases in German. First of all, I want to define, what a case actually is. After that, we are going to structure and explain German cases. So, what is a German case? You could see it as a special category in German grammar, consisting of nouns, pronouns, adjectives, participles and numerals which have a certain form that determines their function in a sentence. And that these German cases are responsible for the endings of adjectives, indefinite articles and when to use which personal pronoun. So, let’s have a closer look on each one of our four German cases below. Who (or what) did or is something? Also remember that nominative case is always used after the verbs “sein” (to be) and “werden” (to be). Well, here are some example for the nominative case with the nouns “der Hund” (the dog), “die Katze” (the cat), “das Pferd” (the horse). As you could see in this table, the nominative case does not necessarily change the indefinite article. But you will see later on how German cases have their influence on this part. So, here are some example sentences to illustrate this German case. Der Hund bellt. – (The dog barks.) → Who barks? Die Katze läuft. – (The cat runs.) → Who runs? das Pferd isst. – (The horse eats.) → Who eats? Ladies and Gentleman, let’s go on to a little more complicated one of German cases, the genitive. So, here is a table to show you the influence of the genitive case on definite and indefinite articles of different gender. Now you will see that genitive changes the word endings much more than the nominative case. In this case, you can note clearly the changes of word endings: Masculine and neuter take an “s” at the end, whereas feminine and plural don’t take any “s” as an ending. So, let’s come to the next one of German cases, the dative case. Unfortunately, it is getting quite serious right now. The dative case is really important because it is used very frequently in every-day language, spoken or written. Furthermore, it changed the word endings in all three genders and in the plural forms. But first of all, let’s clear up what the dative actually is: In English you could compare it to indirect object, so the receiver of of the direct object. 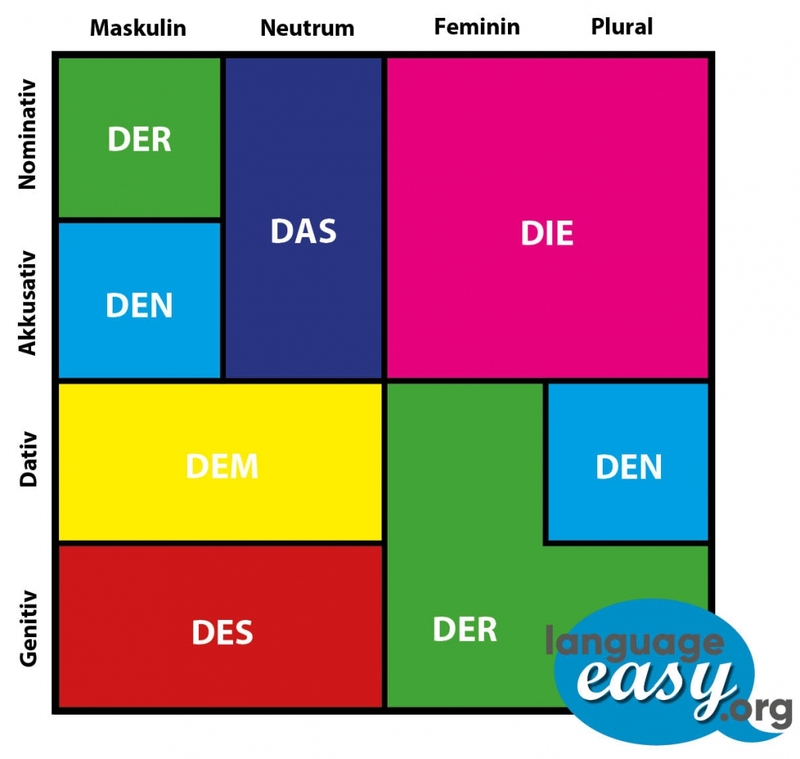 But in the following table you will see how the dative actually works. To whom or for whom is this being done? This is the question you should ask yourself when examining a sentence, looking for the dative case. Usually the equivalent of the dative case in English would include “to”, like our example above. Now, let’s see the use of this German case in some example sentences. Ich geben dem Hund einen Knochen. Ich gebe der Katze ein Speilzeug. Ich geben dem Pferd ein Brot. Finally, we are going to have a close look on another very important German case, the accusative case. In the following table, let’s have a closer look to the word endings. You will see how they change when being used for the accusative case. As you can see, the word endings in feminine and neuter don’t change at all, whereas the word ending of masculine already changes in the singular form. 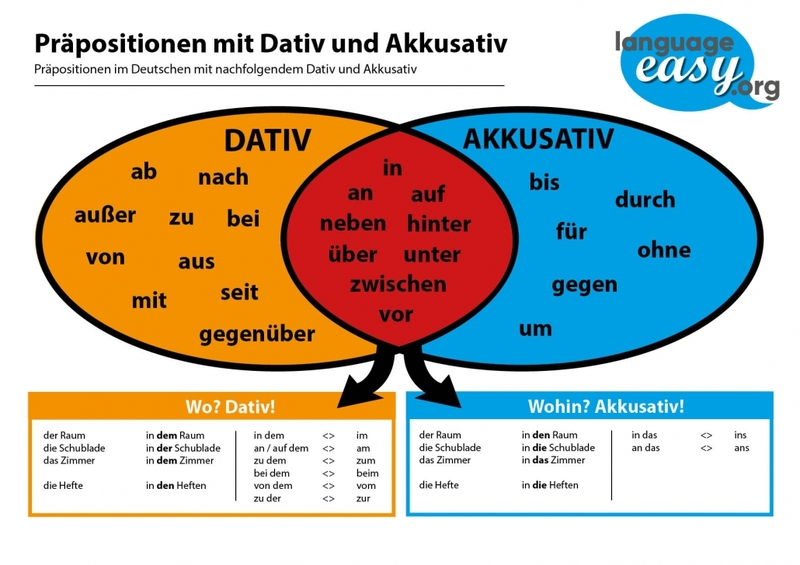 Well, as you might have noticed, it is quite hard to understand the differences between dative and accusative in German. Especially for non-German speakers, the questions you ask in order to find out the case, don’t make any sense. So, focusing on the accusative and dative, there are three ways to find out the differences between these two cases. First of all, there are verb lists that show you which case is connected with each verb. Second, you should learn which case is followed which preposition – something you can observe in picture of this article. Finally, you can ask yourself the question “Wo?” (Where?) – which is always followed by dative, and “Wohin?” (Where to?) – always followed by accusative as it is a of movement. Don’t be sad – I have to tell you that we have come to the end of our small tutorial about German cases. As you could see, German cases are no big deal, as long as you remember to ask the right questions and learn by heart the articles you have to use in one of the German cases. Nevertheless, it’s still hard work and I hope I could help you a little bit in your studies by explaining the basics of German cases. I want you to show a few useful Links and some exercises. In the following you will see some phrases that you should complete with the correct terms. Once you have filled all the gaps, just click on the “correct” button and you can see your errors and the correct results. Good luck and .. auf Wiedersehen!